Alem is an Entrepreneur and Writer with an A.S. in Digital Film Making. 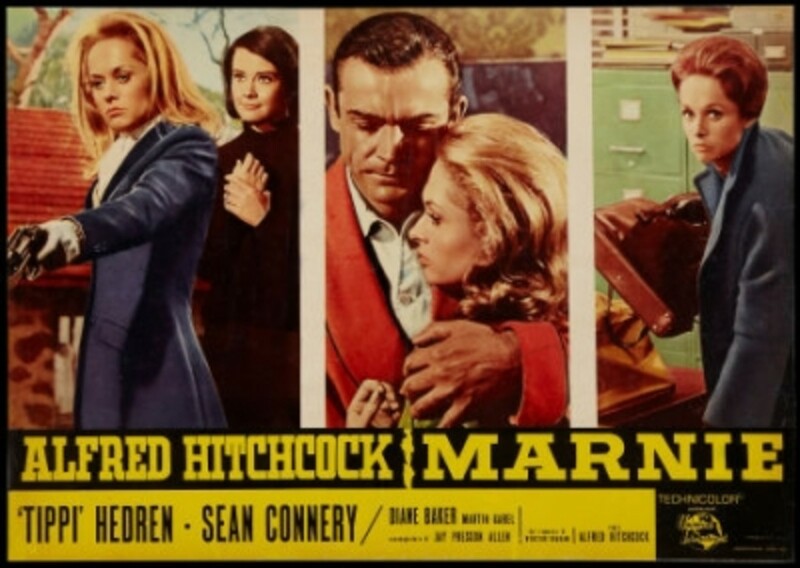 In this article I will show how certain elements of mise-en-scene and editing contribute to the theme of Vertigo (1958) , by Alfred Hitchcock. These cinematic techniques will be pointed out in chronological order, with the focus on what I believe to be the best use of them in each scene. By the end of this reading, you should have intimate insight on my perspective of how the film maker uses his cinematic style to further the film's theme. Before trying to explain how cinematic style enhances this film's theme, I must first explain my perception of what the theme is. I use the phrase "my perception" because most films seem to have more than one theme. According to the perspective of the viewer, the theme may change many times. Without the Director's feedback we are left to decide for ourselves what the moral of the story is. Most of the time no one is completely right or wrong; there are just instances when certain opinions make more logical sense than others. Throughout this film there is one thing that remains constant in almost every scene, greenery. Whether it be a car, dress, shirt, or plant, green is definitely a color value that is used as symbolism. But what does this have to do with the theme? In the forest after Madeleine says that trees are "the oldest living things", Scottie reveals the name of the tallest tree and its meaning. "Sequoia Sempervirens" he says, "always green, ever living." Her response, "I don't like it, knowing I have to die." This conversation introduces the theme and the object used to symbolize it. This film is about the constant battle between our fear of death and our curiosity about the afterlife . Are we in the real world while alive or do we enter the real world when we die? Is the afterlife fantasy or reality? We may be in the fantasy right now. The greenery that is so carefully placed in each scene signifies the process of eternal life that plants possess and we do not. Plants are the oldest living things on this planet. Even the two words plant and planet only differ by one letter. One and the same perhaps? Plants are similar to us in many ways. They grow up and eventually die just as we do, but unlike us there death eventually supplies the nutrition for the birth of more plant life through fertilization. A kind of resurrection. When Madeleine said she didn't like the tree she was reacting out of jealousy. She doesn't like the fact that she has to die and possibly never be resurrected. The film starts off with a close-up shot of a women's mouth and pans up to the women's eye. The screen turns red while focused on the eye and the music hits an eerie climax. At this point we get a wide-eyed reaction shot of fear without being able to see what this women is scared of. A Gaze-Object-Gaze that's missing the object. This shot showcases the fantasy vs. reality aspect of the movies' theme. If you look at the mouth close-up you will notice her attempt to move her lips but she can't. It's like one of those dreams you have when you're scared and you want to yell or scream but your mouth won't open. The first scene also has a dream sequence feeling to it. With the wide shot on the rooftop and the dolly zoom shot of the street when Scottie experiences vertigo on the ledge, the film sets a tone that is outside the realm of reality. The innovative "dolly zoom shot" was first introduced in this movie many years ago and was reintroduced in a huge way to new audience in a movie named The Matrix (1999). "The dolly zoom shot is achieved by dollying back while simultaneously zooming in on the subject or by dollying in and zooming out simultaneously." (Padawer, page 25). This creates a "visually disturbing effect." (Padawer, page 25). Interestingly enough, the movie that reintroduced audiences to this once innovative cinematic technique, introduced one of their own at the same time. The Matrix (1999) introduced "Bullet Time" to the world when it opened to large audiences in 1999. "Bullet time" refers to a "digitally enhanced simulation of variable speed" (Wikipedia).These are two films with similar themes, opening scenes, innovative cinematic techniques, and interesting directors. I had to make a comparison. The scene in Gavin's office foreshadows everything that's going to happen to Scottie. First of all the color values are used as symbols. All the red that consumes the room signifies blood and death. Especially that red rug that is thrown in our face deliberately with the wide shot at the very start of the scene. Next is the picturesque medium shot with Scottie sitting right in front of the camera and Gavin standing behind him. The composition and depth of this shot cuts the planes in 3-diminsions. If you pause this shot it looks like they aren't even in the same place, this gives you the idea that Scottie is in a world of his own. The director must have used a wide-angle lens for this shot to utilize its short focal length. "A lens with a short focal length creates large depth of field. This makes objects in the back ground appear further away than they actually are." (Padawer, page 18). The next shot is a quick cut from a close midshot of Gavin to a very close medium shot of Scottie. Next the camera eerily zooms out just as Gavin is asking him if he believes in ghostly spirits. This whole sequence ends up giving the viewer the feeling that someone else is watching these two men. The camera becomes a spirit in the room. In the next significant shot of the scene, Johnnie sits in a red chair and listens to information regarding Madeline. He is engulfed by the strong presence of the chair's red color. This use of color values can foreshadow love or death. We find out by the end of the film it ends up being both. So what about the plants? Where is the greenery? Its presence is subconsciously noticed in the scene also, in fact it may even be the dominant. There's a plant right next to the front door that makes a scene stealing appearance four very different times. First when Johnnie walks in, second when he stands next to the door, third while he is sitting in the chair and finally and most blatantly when they are both standing next to the door. In the last of the four appearances the plant stands between them, creating what seems like a referee in a boxing ring separating two fighters. This foreshadows that Madeleine will come in between the two men. During every appearance in this scene the plant becomes the dominant instead of a subsidiary contrast. Without knowing why, your eyes are attracted to this plant. 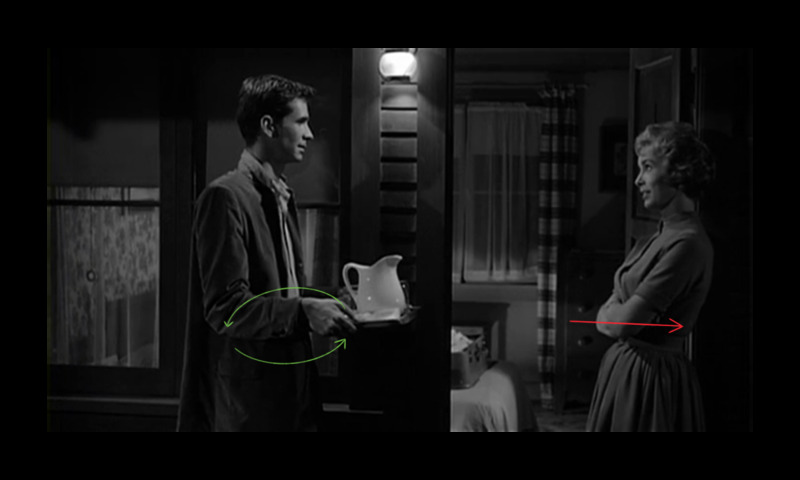 Hitchcock accomplishes this by using excellent character placement during shots where the plant is present. He attracts your eyes to the plant by strategically using different camera angles, shot types and most importantly tight framing that always incorporates the plant into the frame. It's like that person who sneaks into the background of your picture right as its being taken. When you look at that picture that person sticks out like a sore thumb. The first time Scottie and Madeleine visit the Spanish mission the stable is introduced in an interesting way. Instead of a standard continuity shot, the camera starts off across the street with a still horizon shot, which then pans screen right and turns into a wide shot of the stable. This once again gives the viewer a feeling that someone else is watching them. As usual, the color green makes another strong appearance as the grass on the front lawn. By this time in the film, this color has become one of the main characters. I think here the director is using it to remind the audience of the color one last time before he beats you in the head with it during the third act. Inside the chapel Johnnie faces his fear of heights in order to make it up the stairs in an attempt to save Madeline's life. 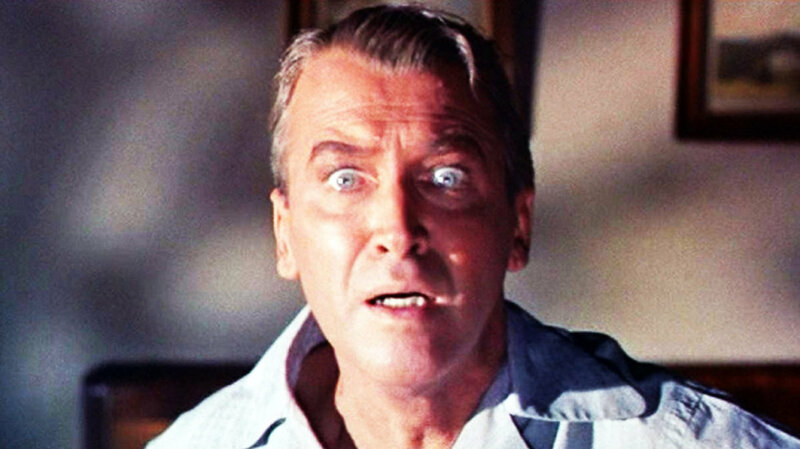 Just like in the beginning of the movie, the zooming effect is used to give the audience a "Point of View" look at Scottie's vertigo. This puts us in a position to understand what his mind is doing to him. He battles his mind and almost makes it up the stairs, but it's too late and a woman falls to her death. This is like the battle between life and the curiosity of afterlife that goes on in our minds. The closer to death we get the closer to an answer we are, but we are afraid to go over the edge to find the truth because of the unknown outcome. Scottie even alludes to this in the stable when he says to Madeline, "you see? There's an answer for everything." In the final act Madeline returns under a new persona, with brown hair and a new name. But the color green remains. This time it is used to compare her to the resurrection that a plant undergoes. She has just died and returned just like a leaf that falls off a branch and hits the ground. It eventually dies and gets absorbed by the ground, becoming part of the Plan(e)t. The color green makes its final appearance in the hotel room in the form of a high contrast lighting key. As Johnnie waits for the newly blonde Judy to come out of the bathroom the fluorescent green light from the sign outside engulfs the room. When she walks out toward him the green light is superimposed around her body giving her the appearance of a blurred ghostly figure. And what do ghost represent?The existence of an afterlife. When she steps out of the green light and back into focus they kiss and embrace. At this moment the camera follows them in a 360 degree rotation while the background momentary changes from the hotel room to the stable and back. Scottie is in a fantasy world. Judy is also. But neither of them want to admit it to themselves. In one of the last scenes Johnnie listens to Judy explain herself and profess her love for him. Each time the camera cuts to Scottie his face is engulfed in darkness. The low key lighting places a shadow around his face. This signifies his mental position while listening to her. He is half in and half out. He doesn't know if he should give her another chance, leave, or turn her in. Eventually they embrace and kiss until Judy notices a shadowy figure appear in the darkness. Gaze-object-Gaze to end the film, just like the women in beginning. We have to assume she was the women in the opening credits, and now we finally get to see what she was so afraid of. In the last shot of this movie, Scottie stands on the ledge and looks down at what we assume is Judy's body. He turns his palms slightly outward resembling most photos you would see of Jesus during his resurrection. If you don't believe me just type in "Jesus Resurrection" into a Google image search and compare it to the shot. Now for the plot twist of this essay. 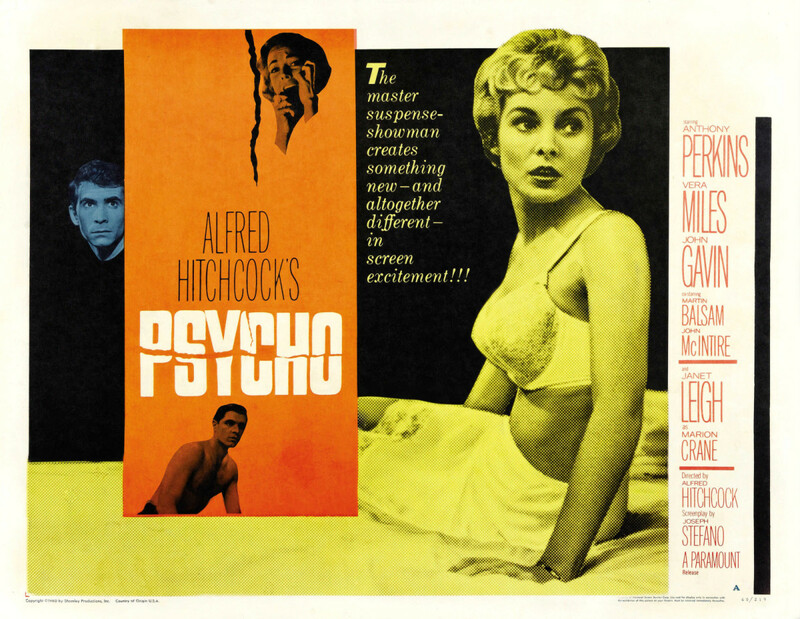 I am going to tell you exactly why Hitchcock made this film and why he shot it the way he did. This man was obsessed with resurrection. From the movie's theme of death and the afterlife to the ongoing use of plants to represent it, he is constantly reminding you of his fascination with life after death. Even with this existence of love in the film he is still engulfed in this obsession, asking us the question, can love be resurrected? 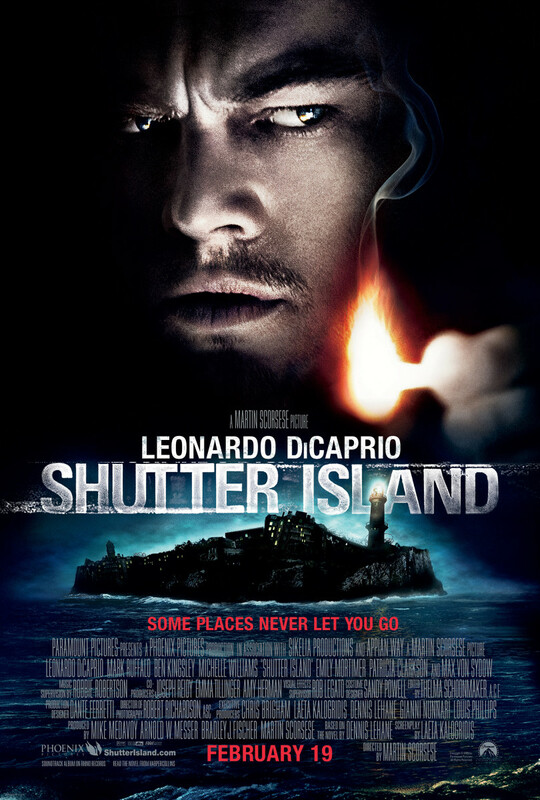 As for the way this film was shot I have to admit, I now understand why it's on the top of many critic's list. With the stalker-like camera tricks he uses to give you a feeling of voyeurism, he accomplishes the very thing that he obsesses over. 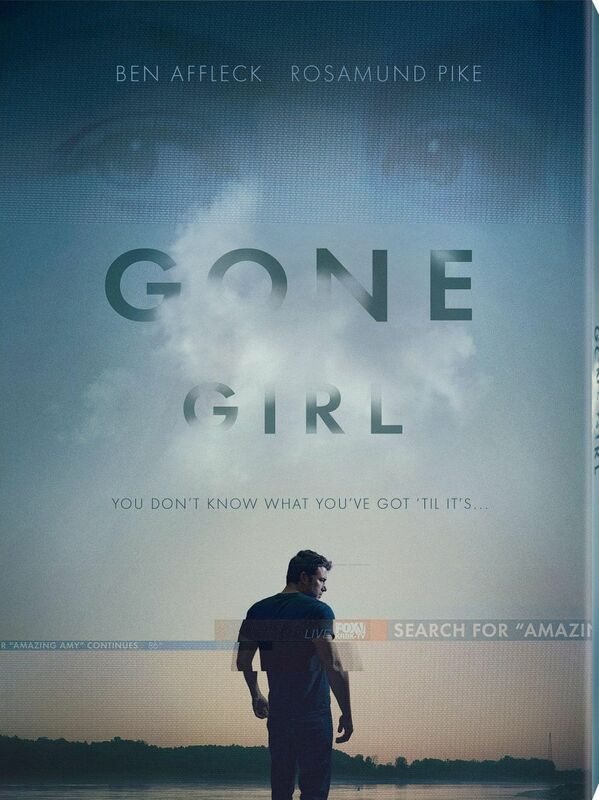 As I said before, when you watch this film there will be certain scenes that give you the eerie feeling that the camera is actually a person inside the fantasy world of the movie, watching them. 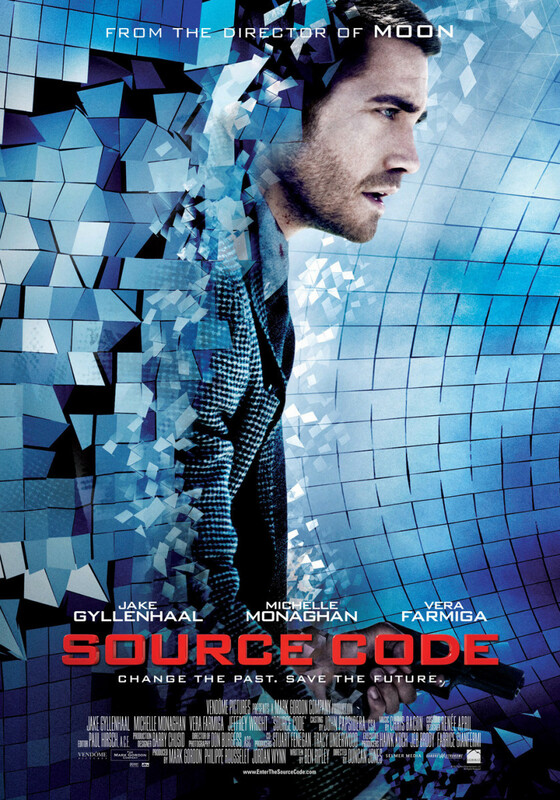 That person is the same man who wrote and directed this movie. Every time a plant or the color green is shown he is reminding you of resurrection. And during these moments he wants you to wonder if he is still alive in some form, watching you. But there is only one way to find out if that's true. I think he did pretty well getting his theme translated in film. How about you? P.S. 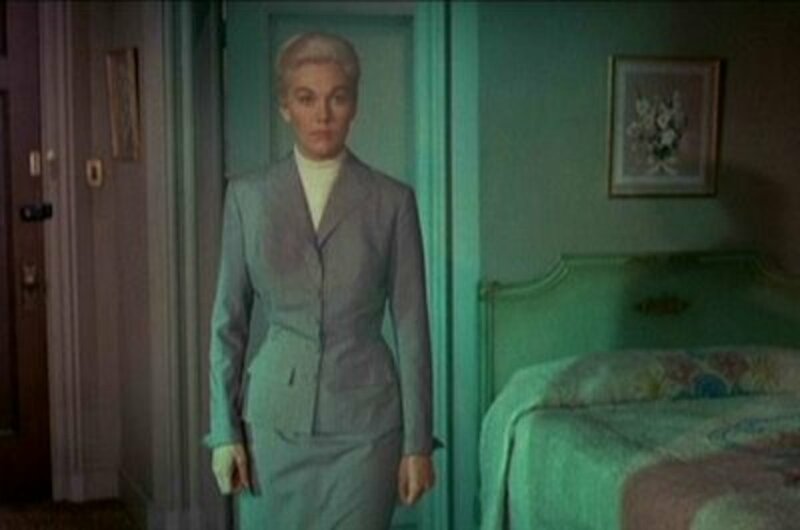 For an added bonus I have provided both opening scenes from Vertigo and The Matrix.Take a close look and tell me if you see anything eerily similar about both. Did Hitchcock have a reason for disabling the left brake light on Scottie's Desoto? I noticed it in the scene where he saves Madeline in the Bay? I can't hear annthiyg over the sound of how awesome this article is. 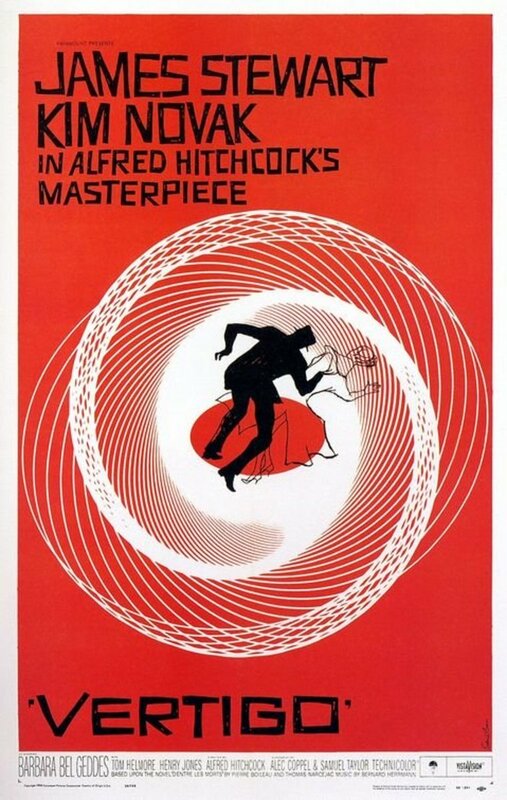 since 1958 occurred before 1975, the dolly zoom was in fact first used in Vertigo. idiot. Fantastic article. Very insightful and well written. I would like to point out that the "dollyzoom shot" was first used ever by Spielberg in Jaws (1975).